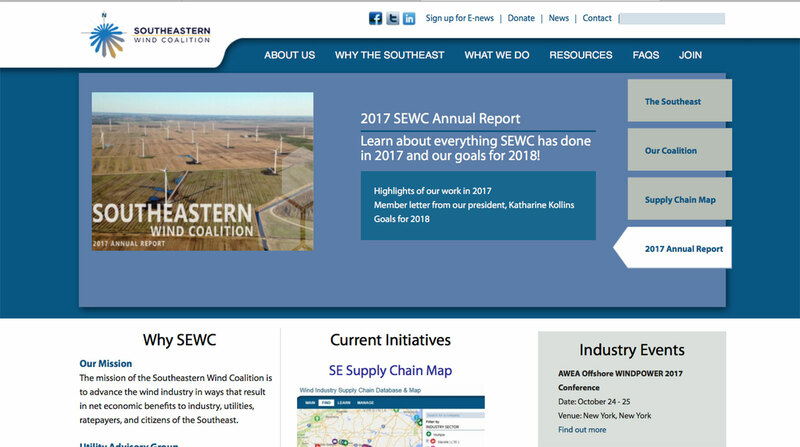 As a media provider for the clean energy industry, we are proud to have designed and developed the website for the Southeastern Wind Coalition. This Expression Engine content management site allows the coalition's officers to update the site's content as needed. The site is designed to inform the wind energy industry, government decision makers and others about the economic opportunities of wind energy in the U.S. Southeast. A linked slideshow across the home page of the site spells out the benefits of wind energy and the suitability of the Southeast for development. The site showcases advisory groups and research initiatives spearheaded by the coalition. A special section for coalition events has information about industry events. The site also has a separate section for the wind industry that includes a supply chain map which members of the industry can add thir information too. The site is fully integrated with social media.